I met with FAST (Falls Area Singletrack) Monday night. 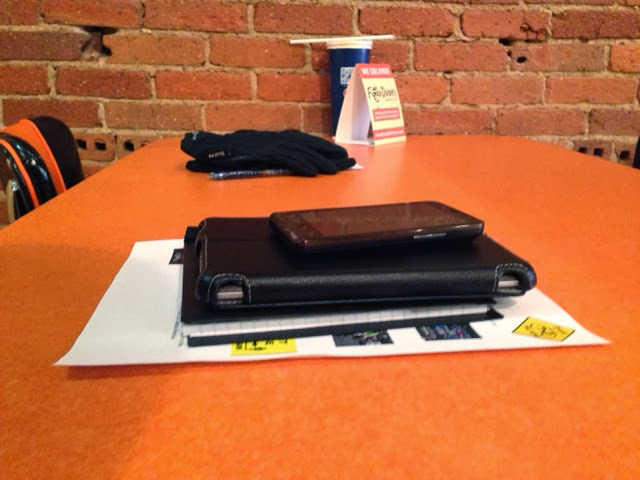 We're looking at doing some community building things before spring. 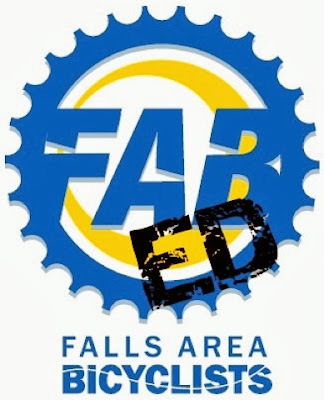 Today at Chedds good things happened with FAB ED (Falls Area Bicyclists Education Committee). We talked about...wait for it...education. We have a cool logo. Today I delivered this to planners and consultants associated with the I-229 Exit 5 (26th Street) Crossroad Corridor Study project. If you find yourself nodding as you read it jump over to http://www.26thstreetcorridorstudy.com/getinvolved.html, leave a supportive comment, and Get Involved. 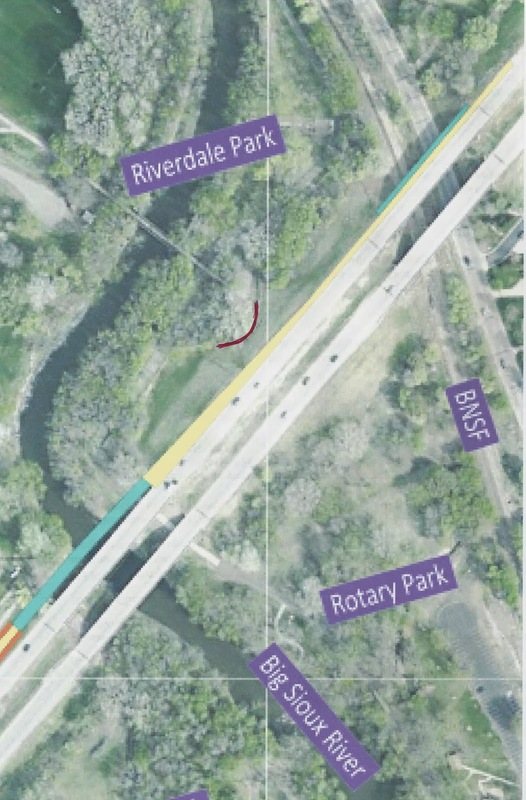 Local riders will want to pay particular attention to the proposed changes proximity to the bridge in Riverdale Park. 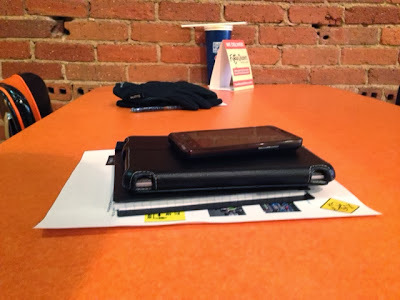 At the January 15 Study Open House there was an invitation to provide ideas and thoughts about ways to provide access to Rotary, Pasley Park, and the bike trail. Just in case nobody reads past the first 10 sentences I’ve summarized my thoughts as succinctly as possible at the beginning. You must preserve the bridge that connects Riverdale Park with the bike trail near I-229. I fear that interchange option 5A overlooks this. 24th Street provides excellent access to the bike trail and parks without the need to utilize 26th Street. A 26th & Southeastern intersection with increased capacity and efficiency is mostly only attractive to people in cars. 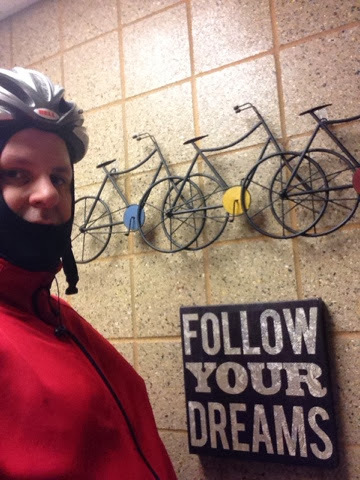 I propose a pedestrian bridge and multi-use path connecting the area around 33rd & Yeager Road to the bike trail bridge over the river near the Tuthill Lift Station. This pedestrian bridge provides some useful hidden benefits. First and of primary importance – your option 5a for the interchange concerns me greatly because I fear losing an important bike trail access point. There is a bridge crossing that connects Riverdale Park to the bike trail. Your exit ramp begins near the footing of this bridge. You must not remove this bridge. It would be a step backward to infringe on people’s ability to get to the bike trail. The red line indicates existing trail adjacent to the bridge footing. The yellow is the beginning of the proposed exit ramp. Now consider for a moment 24th Street and the way it enables pedestrian and bicycle access to Rotary and Cherry Rock Parks because of the bridge at Riverdale Park. The neighborhood north of 26th Street can access the bike trail without the adventure that is 26th Street, I-229 and Southeastern Drive. 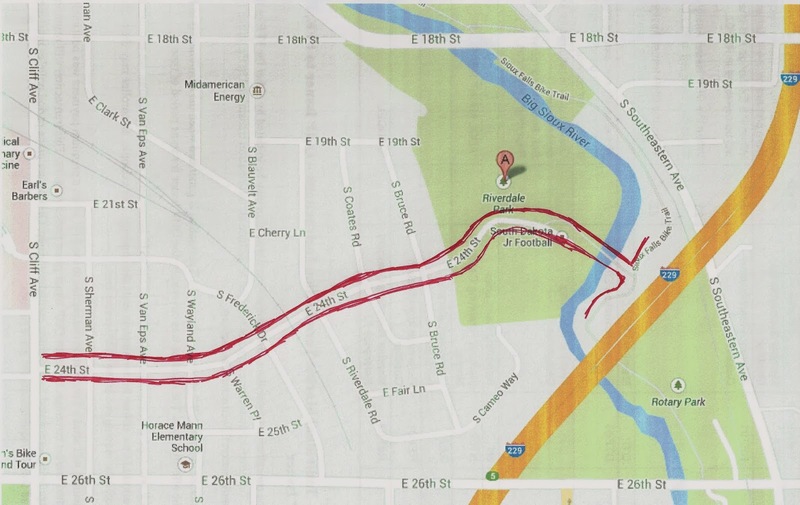 The red lines indicate 24th Street east of Cliff Ave to the bike trail. As a walker I cannot view increased efficiency and capacity at any 40,000 vehicle per day intersection as an improvement. 41st & Louise is hardly enjoyable. The improved 57th & Western intersection killed arguably our city’s most experienced walker in its first months. As a bicycle rider I would much rather navigate a congested 26th & Southeastern area because drivers must be alert and paying attention to their surroundings. I certainly heard clearly one meeting attendee mirroring the common mindset that unregulated right turns off I-229 and onto Southeastern would serve people well. This is a nightmare for anyone not surrounded by 4,000 pounds of glass and steel. Second, I propose we mirror the function of 24th Street to the south of 26th Street. 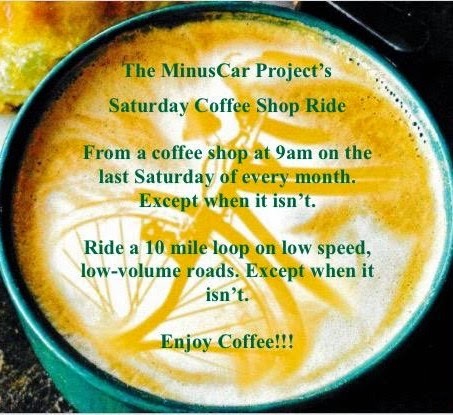 Do this with a pedestrian bridge and multi-use path connecting a point somewhere in the 33th Street & Yeager Road area to the bike trail bridge over the river near the Tuthill Park Lift Station. A pedestrian bridge here would allow access to Tuthill and Pasley Parks from the west. The neighborhood south of 26th Street would benefit directly. 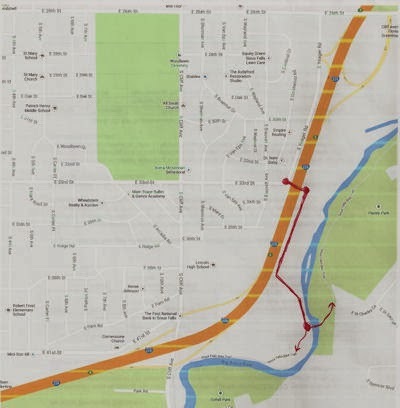 The red line indicates my proposed pedestrian bridges over I-229 and asphalt multi-use trail connecting the bridge to another bridge by the Tuthill Lift Station. There are three additional less obvious benefits from having a pedestrian bridge. The neighborhood directly west of Lincoln High School would benefit. Between Arcadia Road & 38th Street there is a signal protecting pedestrian crossing of Cliff Ave. The synergy of the Cliff Ave crossing and the Interstate crossing is the sort of “connection making” that planners and engineers should dream about. Walkers and bicycle riders currently achieve access to the bike trail and Tuthill Park by navigating the horrible unfriendly interchange that is Cliff Ave and I-229. With this bridge the park system could be shared with residents in this part of the city without directing them through the convergence of Cliff Ave, 41st Street, and I-229. Access to the river park system along the southern portion of the I-229 Corridor is woefully insufficient. A bridge would dramatically improve the situation. It’s time to continue to increase lower traffic volume crossings of I-229. There are existing crossings at 6th, 12th and 18th Streets. Travelling further south there is not another opportunity for pedestrian and bike friendly crossing except for the new bridge connecting Solberg and Tallgrass Aves. Please, let’s not miss this opportunity to advance our friendliness to people who would like to travel by foot and bicycle. I thought I could sneak a ride in before the wind and the weather changed. I was wrong - but I did ok and my bailout worked in the end.